Looking for an affordable small TV? The ultimate choice is TCL 28S305 28-inch smart TV! Considered as one of the best HDTVs for home in 2018, this Roku television promises to deliver you an incredible TV-watching experience. What I like most about TCL 28S305 is its superb user interface: you have no difficulty to use thousands of apps as well as stream videos since all can be controlled by just one simple remote. Also, compared to other 28-inch TVs on the market, this one is more affordable and frequently updated. The only downside is that – the 28S305 28-inch model does not offer Ethernet port. Continue reading to learn more about this TCL smart TV. The manufacturer gave the S305 a very basic design. From the first glance, it looks similar to the TCL 55fs3750 from the front; however, its nicer looking feet will somehow satisfy consumers. The plastic stands are nearly as wide as the TV length, and the borders come with an average thickness. The inputs are placed on the back of the TV at the position fairly easy to access even if the TV is mounted to the wall. Talking about the build quality, it looks fine but sometimes a few parts make you feel plasticy and cheap. With an affordable price, the TCL S305 TV has done very well in delivering a decent picture quality. With the native contrast and black uniformity, the images are displayed greatly providing the users a fair movie experience. It works much better if set in a dark room. On the other hand, the picture quality is not really good in a bright room as its peak brightness is not high enough. If you are considering buying the S305 model of TCL to watch sporting events, you may want to think again due to its below average viewing angle and gray uniformity. Not yet, the quality is likely to be diminished with a large group of people watching. 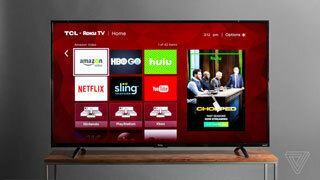 TCL 28S305 runs Roku TV, which is simpler and easier to install as well as avail than several other smart OS’s. This smart television offers all the needed features that users can totally expect. By signing up in the Roku ‘Streaming Channels’ store, you will be able to access all kinds of popular apps (Netflix, Youtube, etc.) The content can be streamed to the TCL S305 via a smartphone or tablet connection; or, you can use a USB drive. Although the included remote is basic, you can consider utilizing the Roku app on smartphone and tablet app for controlling the TV. With many useful features, it also helps sync the audio from your television through your phone or tablet. Why should you buy TCL 28S305 28-inch smart TV? The S305 model is a decent budget HDTV. Compared to other 28-inch TVs, this one comes with a very affordable price. However, it doesn’t mean the device is built poorly; in fact, you rarely find any television equipped with smart features at such a low rate. Only TCL 28S305 can deliver exactly what you need! For your interest, here is the list of 12 best 28-inch smart TVs with low price! Rosendo Craft is a Canadian BaladnaOnline writer who's passionate about television and photography. He really enjoys Star Trek and is addicted to word games as well as Tetris. He is always curious about wildlife. When not writing, Rosendo usually spends his time testing new kinds of televisions.